Fixed bridges (also called fixed partial dentures) are used to replace missing teeth and gum tissue.They are attached to neighboring teeth and cemented into place. The underlying substructure can be made of a ceramic material or metal, but the restorations are typically porcelain. A fixed bridge right for me? Porcelain can be bonded to a precious or nonprecious metal. Although precious metals such as gold are generally more expensive, some nonprecious metals can tarnish, leaving a slightly dark line near the gum tissue if the porcelain does not fully encase the metal. Zirconia or other very hard tooth-colored ceramic may be used instead to provide more trnslucency and naturalness. These new all-ceramic bridges offer more strength and improved esthetics. It's important to remember that the teeth be replaced and used to support the bridge will be joined. This means you will no longer be able floss through the contacts between the teeth. Instead, you will need a floss threader, which will allow you to floss under the missing tooth or teeth as well as between the teeth. A beautiful esthetic result can be achieved with a conventional fixed bridge because the teeth needed to anchor the bridge on either side of the missing teeth are made into crowns and no metal shows. However, there must be sufficient room for porcelain between the upper and lower teeth when replacing a missing tooth with a fixed bridge. If necessary, either a crown-lengthening surgical procedure or orthodontic treatment can usually help create the needed space. What is a cantilever fixed bridge? A cantilever fixed bridge is attached on only one side and therefore is an option when there is not an anchor tooth available on both sides of a tooth to be replaced. The cantilever fixed bridge may be considered a more conservative treatment than a conventional bridge because fewer teeth are reduced, and the esthetic result can be as good or better. It is also less expensive than a conventional bridge; however, its life expectancy is usually not as long. Another type of fixed bridge is the resin-bonded bridge, also called Maryland brigde. The replacement tooth or teeth are attached to a metal framework that is bonded to adjacent teeth with resin cement. If the teeth adjacent to the missing tooth are intact and in good condition, this type of restoration may be a good choice. If there are cosmetic problems with the adjacent teeth, however, a conventional bridge should be considered. Like fixed bridges, removable bridges (also called removable partial dentures) replace missing teeth and gum tissue and are attached to neighboring teeth. However, they're not cemented into place and therefore can be removed. 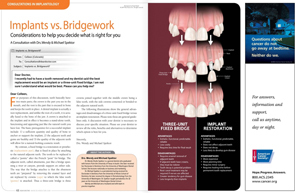 There are two basic types of removable bridges: conventional and precision attachment. Although patients often select the removable bridge over the fixed bridge because it's less expensive initially, this may not be a wise decision since removable bridges have shorter life spans. 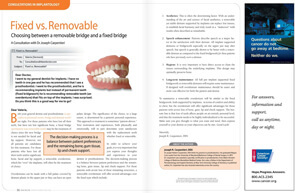 In addition, removable bridges often cause unnecessary wear and tear to adjacent teeth. Your dentist can make a natural- looking temporary bridge—even on the day you lose a tooth! However, the temporary bridge has a relatively short life expectancy and should be replaced with a final bridge as soon as healing takes place. The conventional removable bridge attaches to adjacent teeth with metal clasps. If these clasps show when you smile, the result can be esthetically displeasing. In such cases, the precision-attachment removable bridge described next should be considered. If you can't afford the precision-attachment method of hiding clasps, then a removable bridge with a tooth-colored flexible clasp can be made to replace the missing teeth. Keep in mind, however, that this clasp doesn't offer the support or the stability of the conventional metal clasp, and the bridge may need to be replaced every few years. What is a precision attachment? If you object to the metal clasps found in the conventional removable bridge, you may want to get a precision-attachment removable denture. It involves placing a crown on the adjacent tooth or teeth with a place for the attachment in the back so that no clasp shows. Removable bridges that contain precision attachments are usually made of gold-containing alloys combined with porcelain or acrylic teeth. Although considerably more costly than conventional removable bridges, precision-attachment removable bridges offer a much more esthetic result. Procera AllCeram, owned by Nobel Biocare, is a CAD/CAM based method which produces a crown by overlaying a very durable ceramic coping of either alumina or zirconia, referred to as a "core", with Vitadur Alpha porcelain. Introduced in 1991, Procera can now be used to produce crowns, bridges and veneers. The CAD/CAM method of fabricating all-ceramic restorations is by electronically capturing and storing a photographic image of the prepared tooth and, using computer technology, crafting a 3D restoration design that conforms to all the necessary specifications of the proposed inlay, onlay or single-unit crown; there is no impression. After selecting the proper features and making various decisions on the computerized model, the dentist directs the computer to send the information to a local milling machine. This machine will then use its specially designed diamond burs to mill the restoration from a solid ingot of a ceramic of pre-determined shade to match the patient's tooth. After about 20 minutes, the restoration is complete, and the dentist sections it from the remainder of the unmilled ingot and tries it in the mouth. If the restoration fits well, the dentist can cement the restoration immediately. A dental CAD/CAM machine costs roughly £100,000, with continued purchase of ceramic ingots and milling burs.